Type I: Conventional hydrocarbon-base – for use primarily undiluted on beaches, but may also be used undiluted from WSL spray sets using breaker boards or other suitable means of application and agitation. • The substance is one, the use of which, is for the time being approved by the licensing authority; • The substance is used in accordance with any conditions to which the approval was subject; • No deposits made in an area of the sea of a depth of less than 20 metres or within one mile of any such area, save with the approval of the licensing authority; • Similarly a licence is not needed (if conditions are satisfied) for the loading of a vessel aircraft, hovercraft, marine structure or floating container in England and Wales, with products for deposit for the treatment of oil on the surface of the sea, within British Fishery limits (other than waters adjacent to Scotland). The Ministry of Agriculture, Fisheries and Food has tested this product for toxicity and found it to be satisfactory at the specified application rate. It has also been tested for efficiency and safety in use by AEA Technology Pic. And similarly found to be satisfactory. A person who deposits in the sea a substance not for the time being approved by the licensing authority for the purpose of treating oil on the surface of the sea or not within the terms of this approval, may be in breach of the terms of the Food and Environment Protection Act, 1985. A person who intends to use any substance for the purpose of treating oil on the surface of the sea should also consult the Nature Conservancy Council before beginning operations. Copies of the current Continental Shelf Operations Notice (CSON 7) are obtainable from the Department of Energy, Petroleum Engineering Division, Thames House South, Millbank, London SW1P 4QJ. Further information on the use of oil spill dispersants is contained in the Institute of Petroleum (London) publication «Guidelines on the Use of Oil Spill Dispersants» 2nd Edition (1988). • This composition meets the criteria for not being harmful to the marine environment according to MARPOL Annex V and may be discharged into the sea when used to clean cargo holds and external surfaces on ships. 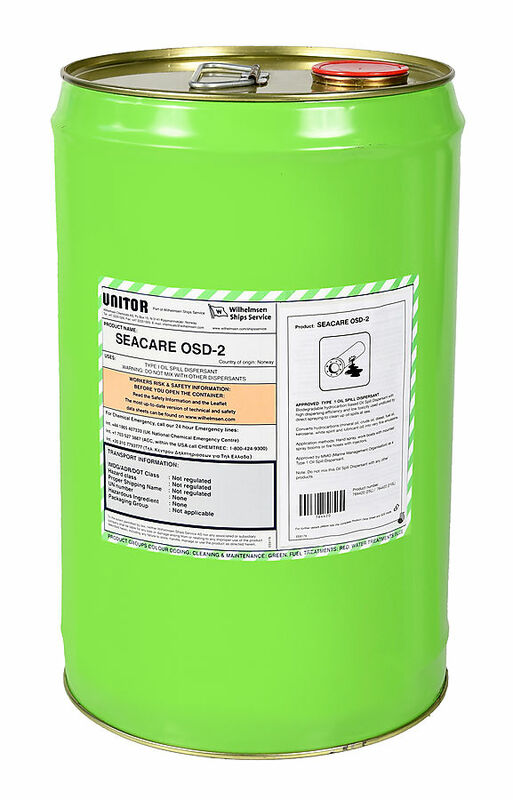 Unitor™ Seacare OSD-2™ is used undiluted by direct spraying to clean up oil spills at sea. Allow some time for the oil to absorb the Unitor™ Seacare OSD-2™ and then disperse mixture by vigorous agitation using fire hoses, the ship’s propeller, breaker boards towed behind work boats, etc. Unitor™ Seacare OSD-2™ should not be used in an area of sea of a depth less than 20 metres or within one mile of such areas exept in accordance with the advice of the local District Inspector of Fisheries of Ministry or Scottish Office Agriculture, Environmental and Fisheries Department (SOAEFD). Unitor™ Seacare OSD-2™ should be applied neat by spraying over oiled areas. Allow time for the oil to absorb the Unitor™ Seacare OSD-2™ then follow by washing down the beach or rocks, etc. The treatment rate depends on the type and thickness of the oil spill, also on the age and condition. Under conditions where it is a thin slick of oil, 1 litre of Unitor™ Seacare OSD-2™ is enough to treat approximately 10 square metres of oil. In many cases, several applications may be necessary. Remove as much of the oil as possible, then spray Unitor™ Seacare OSD-2™ over area covered by the oil and allow some time for it to be absorbed. Disperse the mixture with water by means of a fire hose. Depending on type of oil it may be necessary to use several applications.